Bowel cancer is the third most common cancer in the UK, and if found early there is a better chance that it can be treated successfully. To determine if someone with symptoms such as rectal bleeding, unexplained weight loss, anaemia, abdominal pain or altered bowel habit, has bowel cancer or another serious bowel disease, a colonoscopy is usually undertaken. This can be unpleasant for the patient and carries a small risk of heavy bleeding or bowel tearing. To avoid unnecessary colonoscopies, researchers are looking at tests that can help determine which people need to have a colonoscopy. 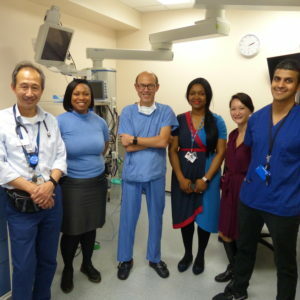 RM Partners is undertaking a research study to examine the effectiveness of a newer type of test, called a faecal immunochemical test for haemoglobin (FIT), to examine its effectiveness in ruling out bowel cancer, reducing the need for unnecessary colonoscopies, and to further understand the different test results for the population across west London. Patients who have been referred by their GP under the 2ww urgent referral pathway and who will be having a colonoscopy will be sent a FIT kit to use at home. A member of the FIT study team will contact them to discuss it in more detail and ask if they would like to participate. Patients who agree will still undergo colonoscopy and any other necessary diagnostics. Results from the FIT test will be compared to colonoscopy findings to determine its effectiveness in predicting bowel cancer. Preliminary results of the study will be reported in early 2018. If the accuracy of FIT is verified, it will be rolled out as a triage test across primary care sites in west London. Our study is supported by NICE, NHS England, and the National Institute for Health Research, and if the test proves successful it will be incorporated into NICE guidance for diagnosing bowel cancer in symptomatic patients who see a GP. The study is still open and many hospitals across England are recruiting patients. Trusts that are interested in participating should contact RMPartners.NICEFIT@nhs.net. Further information is available on the NICE FIT research study website.